Bucking the theme, I wanted to create a tank battle game inspired by the original 'Battle Zone' arcade game. It started out that way, and got...christmassy early on. You should be able to figure it out pretty fast. You're a tank in a pit of abandoned Christmas crap. Are those rocks? Are they coal? Doesn't matter: everyone is naughty in the pit, and the Snowmen are about to judge you harder than an anonymous teenager on the internet. 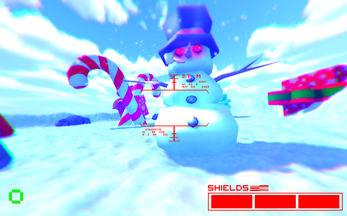 Plenty of bugs: snowmen vanish and get confused. You can flip yourself somewhat easily, if you're determined. I'll spend the next day or two finishing up. Lots of ideas not added to hit the Jam deadline that will make this a bit more fun: planned for the tank to hold a limited supply of snowballs, and be able to reload from supplies that will spawn around the map. And more.